One of the things I most love about Laura Anne Gilman’s fantasy/paranormal books is the way she takes folklore and myth and makes it her own, rendering the familiar into something new and strange, but at the same time, coherent and consistent. She excels at world building. I think Silver On The Road , the first of Gilman’s Devil’s West series, has surpassed her own previous efforts for world building, and that is no small task. Like Emma Bull’s Territory , Laura Ann Gilman’s Silver on the Road is an example of what many are calling “weird West,” that is, it’s a Western with fantasy elements (the publisher is calling it “heroic fantasy”; whatever). In Gilman’s universe, the Territory is that middle stretch of North America West of the Mississippi. They’ve got the United States on one border, and Nueva España on the other (there’s a nifty map in the book). The Devil runs the Territory from a saloon in a town called Flood, smack dab in the middle of the Territory. He’s not the Devil you’re thinking of; more Daniel Webster and Robert Johnson’s “Crossroads” than Paradise Lost . A neat dresser, he runs a poker parlor, and the Territory. And he makes bargains. The right hand gathers and gives, visible to all. But the left hand, Isobel, the manu sinistra? It moves in shadows, unseen, unheard. . . . Until I deem it time for it to be seen and heard. And when it moves, its work cannot be undone. It is the strength of the Territory, the quick knife in the darkness, the cold eye and the final word. Thereupon the Devil sends Izzy on the road, as an apprentice rider with one Gabriel, to ride circuit in the Territory, to learn on the job, to solve problems, and fix wrongs and to do justice. And to fight the occasional monster. We see Izzy grow into Isobel as she becomes the Devil’s Left Hand, and it’s a intriguing transformation. As much as I love Celtic and Northern European inspired fantasy, it’s increasingly being done badly. It’s a refreshing change to see American folk motifs and tropes, and especially to see them executed well. 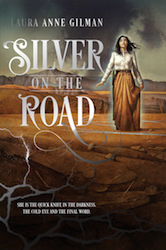 Silver On the Road is Book 1 in Gilman’s Devil’s West Series . I can’t wait for Book 2, The Cold Eye and Book 3 Red Waters Rising . Laura Anne Gilman has a website, and is active on Twitter as @LAGilman. ETA: I forgot the mention the stunning cover by John Jude Palencar.